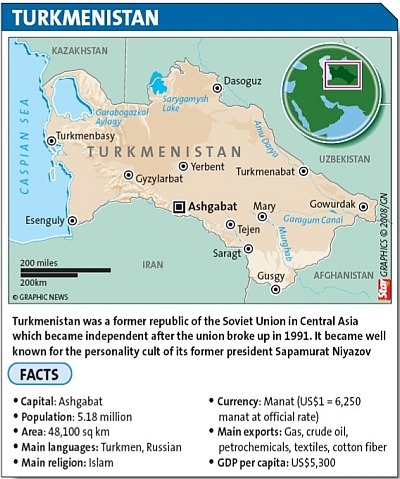 ASHGABAT (Turkmenistan): Malay­sia is keen to participate in Turkmenistan’s tourism and infrastructure development to expand bilateral trade between the two nations which currently amounts to only RM36mil. Prime Minister Datuk Seri Abdul­lah Ahmad Badawi said Malaysian companies had the expertise, both technical and managerial, in areas such as highway construction, housing and hotel development, power supply and telecommunications. “Malaysia is prepared to share her experience in these areas and participate in the country’s infrastructure development on the basis of genuine partnerships,” said Abdul­lah, who is on a two-day official visit to Turkmenistan. The Prime Minister said he would encourage Malaysian businessmen to come and see for themselves the potential investments in Turkmenis­tan. “In the same way, I would like to welcome to Malaysia, traders and investors from Turkmenistan ... I can assure you there are vast opportunities for doing business in Malaysia,” he said during talks with President Gurbanguly Berdimuha­medov. “In these difficult times, developing countries need to maintain a higher level of cooperation between them to sustain development,” he said. Abdullah said he was also glad to note that both countries have made many exchanges of visits since 1994 after the republic’s then president Saparmurat Niyazov visited Kuala Lumpur. “Please accept my visit as a renewal of that spirit of solidarity and friendship between our two countries,” he said, adding that his visit was also to enhance dialogue bet­ween Organisation of Islamic Con­ference countries. Abdullah also thanked the Turk­menistan government for the support given to Malaysian oil company Petronas. He said that on its part, Petronas had sponsored more than 100 students from Turkmenistan to study at Universiti Teknologi Petronas in Tronoh, Perak. Abdullah said both countries, which have already signed five agreements for cooperation in various areas, could also look into new aspects for collaboration such as exchanges in radio and TV programmes. Malaysia and Turkmenistan also signed a double taxation avoidance agreement. 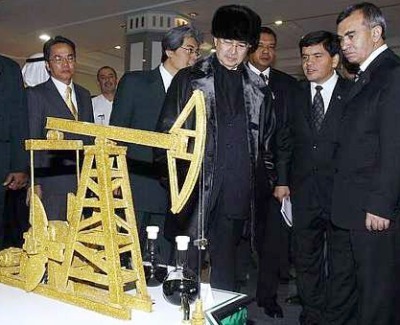 Abdullah earlier visited an exhibition on “Developing Industry of Oil and Gas of Turkmenistan” which was also participated by Petronas. Later, he visited the Turkmen­bashynyn Ruhy Metjidi mosque and laid a wreath at the Monument of Independence, followed by lunch with the Malaysian community here.